Q: My boss doesn't want to pay me properly during maternity leave. Is there anything that shows how much he must pay? A: Firstly, congrats on your pregnancy! (1) An employee is entitled to thirteen weeks maternity leave and may proceed on such leave six weeks prior to the probable date of confinement as stated in the medical certificate submitted under section 8(1)(c) or at a subsequent date at the employee's discretion, and is required to return to work, subject to section 10, no later than thirteen weeks from the date she proceeded on leave. (2) During the period of maternity leave, an employee is entitled to receive pay from her employer to an amount equivalent to one month's leave with full pay and two months' leave with half pay. Good luck, and let me know the outcome! My situations different. My name is Jernella and I live in Trinidad. I'm doing my degree in Education and I have a bias lecturer that claims there is a law that states I MUST stay home three weeks after the birth of the baby. The thing is this is my last semester of the degree and he knows that if I do that I will have to stay back and repeat the whole year. I believe this is true if he were a paying employer but I'm just a student and I would like to believe that it's my decision when I come back. Is this law true? That's the most ridiculous thing I have ever heard. Staying away from school or work after giving birth is your choice. They could possibly stop you before (usually a week or two) to avoid any complications associated with you going into labour unexpectedly, but as a student, this probably won't even apply. According to Section 9(1) of the Act, you're entitled by law to at least 6 weeks post-birth leave... so 3 weeks is wrong, and that ONLY applies to employees. You should report the lecturer for his misconduct. Hi, is it absolutely necessary to commence maternity leave an entire month before the estimated date of delivery? If I choose to start it 3 weeks before my EDD, will this be acceptable? I have been employed on contract with a Govt Ministry since 2004. However my contract ended on 2nd March 2012 and I was only brought back on a 6mth contract as of mid August 2012. However I am now 20 weeks pregnant and I am being told I would not be entitled to Maternity Leave come December 25th which is my due date. This is a bit unfair as I have given that ministry almost 8yrs of service prior to this short term contract of 6mths. If an employee was absent the day before or after a holiday, is the employee entitled to get paid for the holiday? Also, if and employee still has sick leave days left for the year, and the employer refuse to pay the employee for one of his sick days, is this legal? how much months apart should you children be to qualify you to apply for maternity leave? You must be continuously employed for 12 months before those benefits will apply to you. this is the same person that is employed with the company in trinidad since september of last year,so do i have any benefits that i am entitled to? i am not even allowed the time of to gog to my doctor visit, i dont get paid for it. So am i entitled to nis? I just responded to someone asking the same question right above you, so I don't understand why you would ask it again. I'm a contract worker and have been working for the past 5 months, but my employer hired me when i was already pregnant, I'm i entitled to maternity leave or/and N.I.S? And where would i get solid proof of this? good day, can the father of the baby apply for any nis benifits during this period or is he eligible for any benifits? Why don't you just contact NIB? 12 months is the qualifying period. Can you be fired for taking medical sick leave, granted by your doctor during pregnancy before your maternity leave starts? That's illegal. Your employers will be very stupid to do something like that. I have two employee's who is pregnant. She hasn't officially told me. I heard it through staff. One has only been with me for 3 mths and still on probation, and the other with us to 7 months and past her first trimester. Do they qualify for benefits ?? If an HR "official" tells you that she can get benefits, you need to fire that person. You should retain my company to deal with these issues for you "JB & Associates Employment Consulting". Neither of your pregnant employees are entitled to benefits through you. She may qualify through the NIB. Hi can you let me know how many days of parental leave are men currently granted in T&T? Currently, I only know about the 4 days given to Teachers. If she believes that you taking that many days would have a negative impact on the company, then yes. Maybe your role is important and she needs work to be done? I can't say. However, it doesn't mean that you can't use your remaining days at another time. My employer is taking out money for nis but not paying it,is there something I can do about that to make them pay? So what does the employer really do in a case where the worker did not know she was pregnant when taking up employment with the firm and has not worked 1 yr continously, where she does qualify for NIS since she would have made thirteen weeks contributions? Is it that she has to go on no pay leave for a certain period of time around the delivery date? Does that employer have the right to release that worker. Is it safe to say that that employees employment is not gauranteed if she does go on no pay leave? Her only option would be no-pay leave. Getting fired for being pregnant is illegal. Hi, I have been working a year now on 3 month contracts and now started a 3 year contract. I have been employed in the same ministry for 5 years now on different contracts. I never broke a contract for not even for a day. I am currently 3 month pregnant am I entitled to maternity benefits. If you specified a country, I may have been able to help. I am not sure what you're asking. NIB may be best suited to answer that. Hi, What protective law is there for a breast feeding mother who has to return to shift work (6am-2pm, 2pm - 10pm and 10pm-6am shifts) immediately after her maternity leave ends? The place of work is an alcoholic beverage factory. Some one suggested that I should be on 6 months daylight work hours. Is this true? Hi.....I had my baby at 27weeks.....he over for 15 days and passed away.....do I have to take maternity leave? And if I do what will I be paid? Is that company policy? This can possibly be seen as indirect discrimination. Hi, need some advise. I am employed with a company on contract, fulltime since February 21, 2013 and therefore this year February I would have made 1 year with them. I unfortunately have to go on maternity leave by January 31 2013 making me 21 days short of making my year with the company. They advised that they would not be able to pay maternity leave and also ended my contract effective the start of my maternity leave. Any advise as to how to proceed and my rights under the Maternity Act? Hi,I have been,employed wit my job for,the past 6 months and and I have worked straight Down to my 37 week of pregnancy and am still waiting on the hr to send up my maternity form since last yr November and we are already in Feb 2014,so pls can u give me some advice on what should I do since they are takin so long to sign and Stamp my NIS form..i know I won't be able to get any maternity benefits from them becus i haven't make the 12 month employment period wit them but I know I made my 13 contributions through my Nis to NIB so I wod be entitled to a lump sum from them but my employers are extremely stickin to sign the form.what should I do..
You need to write a letter or I can write a letter on your behalf. Send me a private e-mail. They fired you for being pregnant? They must be mad! Send me a private e-mail. Does a person who was employed and left entitle for maternity benefit? I am going on maternity leave. when calculating paye taxes, my total salary for the year would be what my employer gave me alone? and not what i am entitled to with nib right? hey i am currently employed with service commission in Dec. 2012 where i was wrking in an office den was transfer to another ministry in August 2013. I am currrent 20 weeks pregnant and want to kw if i am entitled to maternity leave and benefits. Firstly, thank you for taking the time and effort on this blog. Secondly, could you tell me what is the most recent information concerning paternity leave and what official document could it be found in? For example, if I were to go to the Government Printery and request what ever Acts concerning maternity leave and paternity leave, what could I ask for? Yes. See the following sections of the Maternity Protection Act. 7. (4) An employee who is pregnant and who has, on the written advice of a qualified person, made an appointment to attend at any place for the purpose of receiving prenatal medical care shall, subject to this Act, have the right not to be unreasonably refused time off during her working hours to enable her to keep the appointment. 7. (5) An employee who is permitted to take time off during her working hours, in accordance with subsection (4), shall be entitled to receive pay from her employer for the period of absence. Hi i'm presently employed with CEPEP and have been since Jan. 2012. i am 3 weeks away from going on my maternity leave so i'm wondering if the payed maternity would be in effect with CEPEP workers too. I'm actually not familiar with the structure of CPEP, but I will try to find out this week. Send me a private message and I'll get the info for you. During vacation, if any public holidays are included they are added on to the vacation leave. Does this also apply to maternity leave? CEPEP means Community-Based Environmental Protection and Enhancement Programme. And I don't know how to get a private message to you. Does section 7. (4) and 7. (5) only cover employees working for twelve months consecutively? Are there any circumstances that allow an employer to send you on "leave without pay" due to pregnancy and does this affect the employees right to maternity benefits? The only employers who do that are the ones who want to be sued. That's is discrimination. I didn't say I didn't know what the acronym stands for, I said I don't know what the structure is, meaning, the way the pay and how they class workers. E-mail me via "About Me". Hi,i have been employed as an OJT since october 2012 however i work at a school so i don't receive a stipen during christmas,easter,and august vacation.My due date is 1st sept,what benefits am i entitle too. You are entitled to maternity benefits just like everyone else. As it stands, Teachers and those in the Civil Service are allowed 4 days. It doesn't apply to anyone else. 10. (2) An employee who extends her absence from work for medical reasons under subsection (1) may do so for a period not exceeding 12 weeks after the required date of return and shall inform her employer in writing of her intended date of return. 10. (3) Subject to an employee's right to sick or vacation leave with pay under any other written law, industrial award or collective agreement, an employee under subsection (2) shall be paid half pay for the first six weeks and no pay for the next six weeks. Hi, I was in a three year contract from January 31st 2011 to January 30th 2014. I started another three year contract (same Ministry) the next day (January 31st 2014 to January 30th 2014). I found out i was pregnant in April and will be due October 15th 2014. Will I be entitled to maternity leave with pay from my employer. Hi, If I take maternity leave commencing 8th September, 2014. I work Monday to Friday. When should I return to work? Are holidays such as Republic day and Divali added to your maternity leave. Depends on if you get paid for holidays or not. Yes... your employment is continuous despite the new contract. Hi i was told that since i will not be making a contribution for 8 weeks i will not qualify for maternity benefits. Good day, firstly thank you for having this blog. I find it very helpful. My question relates to clinic appointments. I work in the private sector and my boss indicated that she cannot approve a whole day for my clinic appointment. Secondly, she expects me to take this leave from either sick or vacation leave. Tell me what are my options. If you're fired because of your pregnancy, it is illegal. What if it's not permanent? Is it possible for the contract to be terminated? I recently started working under a contract and I'm just finding out I'm four month's pregnant. I know I wouldn't be able to be paid for my maternity however I just want to be sure I should still have a job at the end of it. Hi I just started working with a company a couple weeks ago and I found out I'm going on my fourth month of pregnancy. The employment is based on a contract. I don't mind taking leave with no pay or even shortening my leave provided I have a healthy delivery. However does the company have a right to terminate my contract? Please read the above conversations. I have repeated this a million times. Any type of action taken during employment based solely on pregnancy is illegal. That doesn't sound unreasonable to me. You don't need an entire day to attend the clinic, do you? And yes, prenatal care can come out of your sick leave, not vacation. According to s.9(1) of the Act, you can begin your maternity leave anytime between 6 weeks prior and the pregnancy date. Hi i would like to know if your maternity leave benefit can be retracted or u will have to give it back/reimburse it if you decide not to return to your job (resign) after maternity leave. I work in the govt service on a two year and then a one year contract at present. Reference to your response to the question below. If the RHA is stating that the break in service makes you illegible for paid maternity leave but your contract clearly states 1 year for eligibility what are your legal options. That's not a break in service. If they're telling you that, you need to contact your union rep or send me an e-mail. My baby is due in January 2015. Our organization is usually closed 2 weeks in December and would resume in January. Is it ok for me to start maternity leave in January rather than December given that the due date is January 18th 2015? Any closure or vacation period is excluded from maternity leave, so regardless of when the leave begins, those two weeks would be added to the end. But I guess the easiest way is to begin the maternity leave after the closure in the new year. Breaks it how? How long? Hi I'm 5 mths pregnant and I have been employed with a company for over 4 years now, due to many complications in my pregnancy I have to attend clinic regularly, however, my employer refuses to pay me for my clinic days and says he has never know about anything like that because he never had to pay his previous employees, he even went as far as to get his consultant involved and apparently his consultant does not know about this either, I am beginning to think that I am the wrong one here, am I supposed to get paid for my clinic days or not? hi good evening, just want to find out a question, I'm a pre school teacher working in a private school, i have been working their for 4 years and now i'm pregnant, my employer state that that the school will not be paying maternity leave, what she state that together with her and my health advisor will fill out the necessary NIS forms for payment, my question to you can she do this? is this legal?, if not what can i do about this. If you've been working for more than 12 months, it's illegal. I think your employers need to be reminded of their obligations under the law. Send me an e-mail so I can assist you further. Now, if you’re having complications and your time off is more than this, then you may be hindering the operations of the company, and then I can see the employer having an issue. But that’s another complication by itself. I work in the private sector where we are usually paid during public holidays. If public holidays fall during my maternity leave, am I entitled to get those days back? I was advised that I would only get days added on if a public holiday coincided with vacation. They have to sign it. If not, report them. That's a question for Inland Revenue. Questions like this annoy me because the requirements are clearly stated in the post. Ok so this month I had 2 clinic days and I did refer my employer to the MPA to which he said he was going to speak with his consultant and get back to me, the entire month passed and it so happened he told me he did not get to speak with his consultant and he deducted the days from my salary. he said by year end he will speak to his consultant and from there on he will know what to do but for now the deductions will continue. Is there anything that I can do about this? or am I supposed to just wait for him to speak with his consultant ? Look under "About me" and send me a private e-mail. If a business is closing down and I am about to go on maternity leave do they still have to pay me as well as I have two weeks vacation pending do they have to pay me for that as well. In work in the private sector and during my pregnancy (at 30 weeks) I was put on sick leave until delivery. My employer wrote me advised that I was placed on maternity leave and the balance of my sick leave was applied to the maternity leave. Does an employer have the right to do that without consulting the employee? As it was, I would have had only 6 weeks with baby before returning to work! 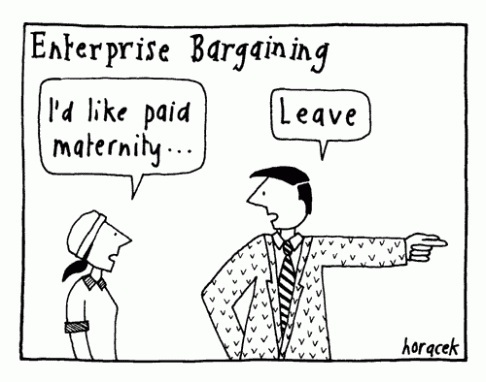 Do you pay PAYE while on maternity leave? That is illegal. I have answered this many times on this website. Good Day, I work in the private sector, is an employer legally required to have provisions in place (room etc) for the express of milk for breast feeding mothers? Good day, What benefits eg. sick leave, casual leave, are OJT's entitled to? Same rights as everyone else, but no one is fighting for it. No matter how much I tell OJTs to come to me, so we can go after the government. I would like to know if an employee receives benefits/ allowances such as COLA, Pension, telephone and travelling, would their allowances be protrated? or would that not be entitlted to any benefits? I tried my best, but I couldn't understand what you're asking. Good morning, Firstly I must thank you for your assistance to women who need intervention, as employers seem to lack knowledge of the maternity laws of Trinidad and Tobago. I am presently faced with a challenge but would accept if I maybe wrong. After working my contracted period with my institution, I was paid less the amount I should receive for my gratuity. The reason given was that during my maternity period I was paid by the institution one month full pay and two months half pay within my maternity period. The two months that I received half pay that was paid by NIS is deemed in their understanding as a "benefit" and therefore, because their is a distinct between salary and a benefit or allowance and grant, the Institution states that it is fortified in it's view having considered the legal definition for the term salary. 1. Is that explanation correct? 2. If not what can I do with this matter? I know you may have answered these questions in previous posts but I wasn't able to locate them. No1. If during the pregnancy the doctor puts you on 4months bed rest prior to delivery of the baby.How does this work,Are you the employee entitled to these 4months with full pay in addition to the 14weeks maternity leave after the baby is born? No.2 If you have unused vacation are you allowed to take it right after maternity , so that maternity rolls into vacation? I'm an OJT...You're entitled to 12 days altogether...if I remember correctly. 5 sick leaves and 7 personal days. Additionally, you get up to 2 hours tie off if you have school/classes and the day off when you have exams. #1 - No, that 4 months would be unpaid leave once you've used up your sick leave. #2 - Yes, but of course, it's up to your employer to approve it. Their argument seems to be correct, but it's the first I'm hearing of it. Hi I'm working with this company for 2 yrs..I recently found out that im pregnant yes my boss said I'll get maternity leave pay. But I find 3 months is a little bit to stay away form ur child n I have been getting problems with my manager she pisses me off..if I leave on my maternity and I don't wanna come back..after I leave..is that possible or I have to go back n work?? Slavery was abolished in 1834, so if you choose to stay home, that's not a legal question... no one can force you to work. No, it's the employee's choice to decide when. Section 9(1) of the MPA states that an employee is entitled to fourteen weeks maternity leave and she may elect to proceed on such leave six weeks prior to the probable date of confinement as stated in the medical certificate or at a subsequent date at the employee’s discretion. Of course... I wouldn't say anything to your employers until 11th March, so you'll be sure that you've met the 12-month requirement. I am a monthly paid contract worker. My gross salary is nine thousand dollars ($9000.00). I went on maternity leave from 18 September to 24 December, 2014. I got an approval letter stating one month full pay from 18 September to 17 October 2014 and two months and one week half pay with effect from 18 October to 24 December 24 and to resume on December 29th, 2014. I resume on 29th December 2014. I got full salary with NIS, Health Surcharge and PAYE deduction for September and October. In the month of November I got $4500.00 as gross salary which is half salary. Then in the month of December I got gross salary as $5516.13, an overpayment of $1000.00 was deducted and $5.00 as PAYE. I received a letter stating i received full pay for period 18 to 31 October 2014 which resulted in overpayment of $1999.26. Please let me know if this was calculated right. Section 9(2) of the MPA says 1 month full pay and 2 months at 1/2 pay. If I am pregnant again and the baby due 15 months after I last went on maternity leave Am I still entitled to leave with pay? According to section 18(2) of the MPA, you're only entitled to maternity leave pay every 24 months. Good day, when checking the 14 weeks of maternity leave, can you confirm that you do not get extra days when a holiday occurs during that period of time? I am on a two year contract. The contracted period is 1st April 2014 to 31 March 2016. I am thirteen weeks pregnant and the doctor gave me two weeks sick leave due to complications. However I am monthly paid in my contract and has fourteen days sick leave in each twelve month. I can only take vacation in the 11th month. I have also utilized four days sick leave before. I would like to know if money will have to be deducted from my salary for days taken in excess which was due to maternity. I am given time off to attend clinic. Anything else, you'll have to use your sick leave & vacation. If that's used up, your employer can deduct your salary. I am currently unemployed and pregnant do i qualify for maternity grant from NIS as I have been paying NIS prior to this all the time since my legal age of employment? How much time is an employee who has had a miscarriage at 28 weeks entitled to. Does the employer have to pay full maternity benifits even though she didint reach the time to go on maternity. As long as you're being fired for a reason other than your pregnancy, it's legal. I can't confirm that because it's not true. OF COURSE you get extra days if there's a holiday. I have been employed with a company since August 1st 2014. I became pregnant the last week that same month but unaware as I received no symptoms except for irregular periods which was normal since I gave birth to my 1st child in January 2014. I only found out in October 2014 when I got eczema and they ran blood tests,etc. I immediately informed my employer. By this time my probation period (3 months) was over and I became permanent. My due date is 16th may 2015 and I go on maternity leave from 28th April 2015. I know that you said you must be working continuously for 12 months in order to get maternity leave with pay from the employer but I researched and found that in the case of daily paid workers, they must be continuously employed for 150 days. I am a daily paid worker, I am rosterd to work 246 hrs a month. In this case, I'm I entilted to maternity leave with pay from this company? Yes, if you're hourly paid, according to section 8(2) of the Maternity Protection Act, you are considered to be continuously employed if you work 150 days within a twelve month period, and therefore entitled to maternity leave with pay. i started a job on the 31st of October 2014 and in February of 2015 i got pregnant so with i was advise that in order for me to fall under the pregnancy act i will have to work my entire 8 mths and something in my work place but with doing that will i be still cover under the pregnancy act?? There's no such thing as a pregnancy act... you clearly haven't read the post before asking this question. If you're monthly paid, you must be employed for 12 months. If you're hourly paid, 150 days is sufficient. So what about the act 10(4) does that mean you have to come back out to work? I am working in my company for the past 6 yes this is my second pregnancy, I am 28 weeks pregnant and when I told them I have clinic all of a sudden I have to apply for it as a personal day. I know this is not legal so what can I do about of? I'm a bit stressed as I was told today that I should not have been paid while on maternity leave given that this is my second pregnancy in 24months. I gave birth in September 21, 2013 and January 12th 2015. If I had known before maybe it wouldn't be so hard but now I have to pay back at least 14,000.00. Could you kindly confirm if this is correct. On a good note though I just realized while reading throught the blogs that any public holidays during the period of maternity leave should be added as in the case of vacation. Under what section of the act is this found? My maternity leave started in January 5, 2015. I received full pay 6600 in Jan, 1/2 pay in Feb and March. In April I was also short paid as my gross was $5,400.00 I queried it but they said it is accurate but I do believe something is wrong. Any thoughts. Section 18. (2) - "An employee’s right to pay for maternity leave under section 7(1)(b) is limited to one payment during each period of twenty-four months commencing at the beginning of such leave." Section 19 - "Where an employee is entitled to maternity leave as referred to under section 9 of this Act, that leave shall be in addition to any vacation leave and sick leave to which that employee is eligible." 10(4) allows for an extra unpaid 4 week extension to maternity leave, but notice must be given in writing at least 10 days before the expected day to return to work. I have an employee who is due to go on Maternity Leave in July. She has been applying for sick leave every time she goes to her clinic visits as she does not return to work after her visits. However she started attending Lamaz classes a few weeks ago during her normal working hours. The first time she went she submitted a leave form for the time off but did not indicate how the leave should be treated. She has continued to attend these classes but has not informed the company the dated and times she would be doing so nor the duration of these classes. I became aware of her taking classes b/c on occasions when the manager asks for her, her co-workers say she is at Lamaz class. How should I treat with this situation? Is she entitled to take time off for Lamaz Classes with pay? Isn't she supposed to inform the employer of her intention to do so? Anything else comes out of sick leave & vacation. Everything else will be unpaid leave. I have 2 employees that were on paid maternity leave sometime last year, both employees are about to go off on maternity leave yet again, 24 months have not elapsed from the first leave. employee’s right to maternity leave under section 7(1)(a) and her right to return to work under section 7(1)(c). twenty-four months commencing at the beginning of such leave. Is it that these employees are not entitled to paid maternity leave? Also, our company policy is very much outdated and quite vague on the issue of maternity leave. It states that the employee shall be entitled to leave of absence on full pay for a period of 13 weeks. The MPA has changed this to 14 weeks. Our policy is favouable to the employee, however it is contrary to the MPA. I'm not sure which Act you're quoting, but the 24-month limitation is under section 18(2). The employee is entitled to only one paid maternity leave every two years. The law is supreme... always and forever. How much is 14 weeks equivalent to in days? Never been good at Math... explain in what context you're asking. hi if an employee has been employed with a company for over a year and she is presently on maternity leave which began 12th July but she has also recently been retrenced where her last day of work is the 14th of August. How would her maternity leave be treated in a situation like that? i got retrenched because they are cutting back on staff but i am currently on maternity leave which started on the July 12th 2015 and my last day of employment would be august 14,2015. would i still be entilled to my maternity benefit as per the Maternity Act or is the decision solely up to the company. i am pregnant. And i am due on the 4th November. However the company that i work for normally closes in December for two weeks, which the entire staff is granted there holiday. This year i would be on Maternity Leave around that time. Can you please tell me if i would be entitled to two weeks extra as well as my vacation Money. How does it normally works. 19. Where an employee is entitled to maternity leave as referred to under section 9 of this Act, that leave shall be in addition to any vacation leave and sick leave to which that employee is eligible. ;i was retrenched on the 3rd July, 2015 and i am currently on maternity leave which started on 12th July, 2015 but my last date of employement with the company would be on 14th August,2015. i am a permanent employee. All you did was repeat the dates... I still have no idea when you began working, which is the most important. Can I give my employers such short notice? non-medical reasons until a date not exceeding four weeks after the required date of return if, within ten working days, before the required date, she gives the employer written notice, stating the reason why she is unable to return to work and stating an intended date of return. My employer is insisting that's i use my flex time that i must gain by wrking longers hrs in order to go to my normal clinic visits. Is this right? Anything else and you'll have to use your leave entitlements. If he does fire you, it will be an unfair dismissal. Send me an email. Hi, I am a Gov contract worker employed since August 15th 2014. On July 7th 2015, I had to go on paid sick leave for two weeks due to an infection. I resumed work after the two weeks and intend to go on maternity leave at the end of Oct. Since I went on sick leave in July, does this mean I have not met the criteria of working for 12months continuous to be eliglible for Maternity benifits? Am I entitled to paid maternity leave and NIS benifits? Since I went on sick leave in July, does this mean I have not met the criteria of working for 12 months continuous to be eligible for Maternity benefits? A- sick leave does not break service. Hi. I read through all the posts and while a few seemed similar none was actually the same. I am due on November 24th and applied for Maternity Leave from November 09th. 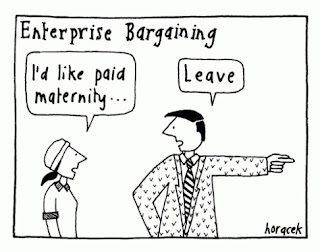 However HR told me i am not entitled to maternity leave and should apply for leave of absence without pay. I have been employed with this Government institution since September 2011. Firstly on a three year contract until September 01st 2014. I was home for one week and then came back out on short term contract on September 08th 2014. The contract was three months and they made me break the contract by 1 day everytime the three months was up which was once in December and once in March. On June 01st I was put on a two year contract which I am presently under. They are telling me I don't have 12 mths continous employment. I would like to know if I am entitled to maternity leave since while on short term I was daily paid since if I stayed home a day it was deducted...I had to benefits and no leave. Even by breaking the contract for a day I would have still made the 150 working days. Also if I am applying for leave from November then 12 mths would not include September 2014 and should start from October. So i would have only broken the contract by 1 day on two separate ocassions. I really need some clarity here as I feel I am being unfairly treated since I was told to break by the day. These employers know what they are doing to give themselves the upper hand and take advantage of women when they are at such a vulnerable time already. Absolutely correct. Actually heading to deal with a similar matter this morning. I started a 3 year contract on 1st October 2012 ending 30th September 2015 at a Government Institution. My employer says they cant pay from 1st October 2015. I am pregnant and due on 6th November 2015. I was told I can apply for Maternity benefit 6 weeks prior to my due date which would take me within my contract. I was advised by my employer to start the maternity from 1st October 2015 after the contract ends as it would be easier to process the gratuity. Also ive been offered a 3 month contract from 8th October 2015 which is a 8 day break. But I have been told I cant accept the contract as I am due to have a baby within the 3 month period. Can you please tell me if the Ministry is correct or if I am entitled to any benefits? That entire practice is illegal. Send me an e-mail, let's take them on. I dropped in my maternity claim while I was 33 wks pregnant. One of the assistant told me i have to drop it in on my last working day or any day after that day. Is this something new? No... your 12 months would restart when your service is broken. You should be paid on time... one odd week, is ok, but not consistently. You can stay home if you don't have money. Thank u so much for responding. But when I do stay home because of no money, is he supposed to pay me still for the days I stayed home for? No, but you should be able to join a union to bring this unfair practice to an end.